Whether online or in the physical world, we rely on cues from other people to help us determine how to act, where to go, and what to buy. These cues constitute social proof. You can think of social proof like a decision making hack; it’s faster and more reliable to follow the crowd than to laboriously compute the pros and cons of every decision. Social proof is just as powerful today as it was when we were evolving as a species. Today, savvy online marketers are leveraging the tactic to boost traffic, increase conversions, and optimize performance. In a world where consumers are 71% more likely to make a purchase based on a social media referral, the companies that understand how to best use social proof will be the ones that get ahead. Here are 10 cool social proof examples from companies making great use of the technique, organized by the 5 categories through which social proof is most effective. User ratings are so ubiquitous online because they are a very good form of social proof. The vast majority of people check reviews before buying products online, and they overwhelmingly trust the accuracy of the ratings. No one does user ratings better than Amazon. They have amassed a huge trove of reviews, and they display them in an easy to interpret way that features a breakdown of all the ratings, from one through five stars. I know that if I was searching for a new card game, I’d be much more inclined to buy after seeing that a product had 30,000+ five star reviews. It takes the vetting off my shoulders — you can trust that the large numbers behind the purchase mean the retailer is selling the item as described and meeting the expectations of other consumers. I’m more likely to buy because other people have bought in the past. If you’ve ever been in the process of booking a flight, you might have noticed a subtle yet effective tool that airlines use to encourage you to make a quick purchase. As you progress through the checkout, the site will alert you if there are a limited number of seats left on the plane. In the case above, United Airlines is using “1 seat left” and “3 seats left” notifications as social proof that the flight you’re looking at is a popular one, which spurs action on behalf of the user. The implication is that if you want a ticket, you better act fast. I am certainly not alone in being swayed by these sorts of prompts, which is why they have become popular across the web. eBay is another company that has figured out how to masterfully create a sense of urgency using social proof. When you seek out a product and the inventory is dwindling on eBay, you’ll see an in-line social proof notification above the number of people watching the item. While it makes total sense that people trust recommendations from friends and family, what might come as a bit of surprise is that 70% of consumers trust recommendations even when they don’t know the person giving the recommendation. Humans just seem wired to put faith in our fellow citizens. That is a big reason why testimonials are such a good example of social proof, and many top companies now feature testimonials prominently on their home pages. Zendesk provides a great case. If you scroll halfway down this landing page example, you are met with three glowing testimonials from happy looking customers. It was smart of Zendesk to use pictures along with the quotes, as testimonials featuring photos perform better than those that are only text. And when research backs up their page setup — with 92% of buyers now seeking out real testimonials before making a purchase. You’ve got customers willing to provide testimonials — and it’s imperative that companies do their best to display them. For an example of the use of testimonials from daily offline life, consider the experience of going to a hair salon. If at all possible, the salon will proudly display autographed pictures from their prominent clientele. Hair salons in Beverly Hills, California are notorious for showcasing handwritten notes from movie stars, and for good reason. I mean, who wouldn’t want to look like Jennifer Aniston or Halle Berry? While certain salons clearly seem to be resting on their past success by using old pictures, the point remains — endorsements, and especially celebrity endorsements, are a fantastic source of credibility and drive increased spending. A great way to use social proof is as a method of showcasing your popularity. As aforementioned, people have an inherent drive to be part of a group. We are naturally more inclined to sign up for something when hundreds or thousands of others have already done so. Therefore, it makes sense to showcase your popularity when you have the chance. For instance, the business intelligence site CB Insights does not just have a call to action asking users to sign up for their email list. Instead, they encourage visitors on their site to join the hundreds of thousands of others who already subscribe to their email list. This is a great social proof example and much more impressive than simply begging for a sign-up. In the same vein, people are motivated to use a product when they know that many of their peers are interested in the product as well. That’s why companies like Proof are building tools to bring visibility to what users are doing on site. 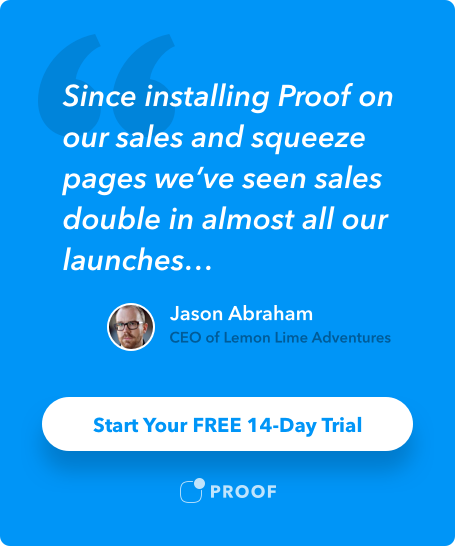 Call Loop uses the Proof’s Live Visitor notification to make sure every visitor knows that hundreds of other people just like them are considering this service at the exact same time, lending it credibility. By using these tools on our own site, we’ve increased our own conversion rates by 53%. It’s all real data, and it taps into our psychological underwiring as humans. Giacomo’s in Boston can draw a crowd even during a cold fall day, which is all the more impressive. I can’t lie, just looking at that picture makes me want to try their food next time I am in town. More and more sites are starting to see the value of tools that allow for real-time, verified conversion updates. These tools alert visitors that others just like them not only came to the site but actually followed through and made a purchase. This sort of social proof is invaluable. For example, Proof’s customer Lawnstarter saw a significant conversion lift after installing Proof’s Recent Activity notification. In the screen below, notice how they mention that “Joe from El Paso, TX” just booked convenient lawn service. You instantly start thinking about who Joe might be, and when the Notification refreshes every few seconds, it adds a badge of popularity to the site. Companies like McDonald’s expertly deploy the same conversion boosting tactics in the real world. For years they have updated their marquees to show how many people they have served. Once they passed “99 Billion” they moved on to “Billions and Billions.” These updates on customers are not quite of the real-time variety, but they achieve the same end — alerting potential customers that this is a quality brand trusted by many people. The use of social proof is on the rise, and for good reason. It just plain works. Plus, Nielsen studies show that recommendations from friends and family are the most trusted source of advertising, and two-thirds of people trust the opinions they read online. If you want to take your digital marketing efforts to the next level, it’s important to build customer trust by using social proof, and the above examples should give you plenty of inspiration. When it comes down to it, humans are social creatures. We follow the actions of others. Use this knowledge to your advantage, and start implementing social proof on your site today.